With every quadratic form a simple algebra — its Clifford algebra — is associated in a functorial way. 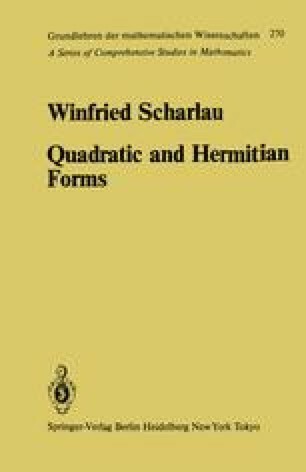 This algebra reflects many important properties of the quadratic form (see chapter 9). It will be shown in this chapter that the classification of involutions on simple algebras is almost identical with the classification of hermitian forms over division algebras. A particularly important part of the theory of hermitian forms is concerned with hermitian forms over group rings and group algebras. This theory is characterized by an attractive combination of methods from many parts of mathematics: representation theory, simple algebras, orders, quadratic forms, algebraic number theory, algebraic K-theory, and even algebraic topology. The very basis of the notion of hermitian forms is a ring with involution, and it is only natural that properties of this ring and involution are reflected in the pertinent theory of hermitian forms.